The Romans mentioned them as a wild plant, but it was not until the 13th century that strawberries were recorded as growing in gardens and so became the 'fruit of love'. There were several wild species cultivated over the centuries with selections of white fruited and green fruited forms as well as non running forms. It was in the early 1700's that Fragaria chiloensis was brought back to France from Chile. This line of plants eventually crossed with Fragaria virginiana from the eastern United States in a French garden in the early 1800's producing a larger fruit with a delicate pineapple flavour which was given the name Fragaria x anaanassa. Fragaria chiloensis occurs from Alaska to California, and from Peru to Chile, and has been recorded as having fruit up to the size of a hen's egg. At the time plants were mostly grown from seed and it was not fully understood that some of the species tended to be either male or female plants. Some time before the 1850's the hybrid strawberries lost their gender based breeding habits and became self-fertile. Once this occurred the strawberry really boomed as a commercial crop wherever market gardeners plied their trade. Disease problems in the 1950's precipitated the breeding of disease resistant forms, but today healthy plants are produced by Certified Growers for sale to the home garden, trade and commercial growers. The parent species grow over a wide range of climatic zones so the hybrids we have today reflect few variations from this ancestry. Strawberries are easy to grow, take up little space, fruit very quickly after planting and grown in the right place are free of disease problems. Apart from the traditional strawberry bed, Hanging Baskets One fun way of growing strawberries is in a hanging basket. Hanging baskets filled with strawberries not only look good, but allow the fruit to stay well clear of the ground. This means that they're much less likely to suffer from pests and diseases. Start by choosing a suitable container. Fill the pot or basket with top quality potting mix. Mix in some slow-release fertiliser and water well. After the strawberry seedlings have emerged, begin watering them regularly with half strength soluble fertiliser. When the plants are big enough to handle, transplant the excess and leave a suitable number in the pot. Keep feeding every two weeks. 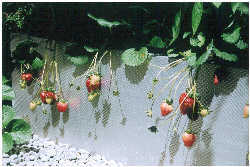 Container Culture Strawberries will grow well in containers as long as drainage and fertiliser requirements are met. Always use commercially produced potting mixes since these have been carefully designed. Supplementary liquid feeding is beneficial, as long as it is formulated to encourage fruit and flowering. A formulation recommended for tomatoes is ideal. Regular watering is necessary in containers, especially hanging baskets, and especially when the fruit are forming. Container culture allows more air movement around the plants and as long as fertiliser and water requirements are met, the plants will tend to be healthier. Containerised plants will come into fruit earlier in the season. Strawberry Tree or just a pot on the windowsill. Strawberries are rich in Vitamin B and C and contain considerable amounts of potassium, iron and fibre. It is best not to wash the fruit, wipe them gently to remove any dirt. Strawberries alone are a treat but add chocolate or cream they become decadent! Also useful for jams, sauces, variety of desserts or dress up champagne, wine or liqueurs. Wind tolerant but not salt tolerant. Winter and spring rainfall is sufficient but irrigation is beneficial in hot weather. The best method is a dripper line with drippers at each plant. Activate early in the morning to minimize humidity build-up. Reduction of water as the fruit begins to ripen will enhance the flavour and firm up the fruit for picking. Strawberries require good drainage, if this is a problem grow the plants on a mound especially in clay soils. Do not plant where strawberries, raspberries or any potato/tomato type plants have been grown before. This will reduce the risk of soil borne disease build-up. Open, airy conditions will minimize fungal disease problems. Dig in plenty of compost of organic matter to help with moisture retention. Strawberries can be planted through a polythene mulch, or directly into the ground and then mulched with straw or similar materials that will allow water penetration, but prevent weed growth. Whichever method is used, be sure not to plant them too deep. Planting through black polythene has the advantage of warming the soil by up to 5 degrees Celsius, but care must be taken to make sure the planting hole is large enough for the plant to emerge without burning on the polythene. A good sized planting hole also allows air around the crown of the plant. Once the fruit has formed, lift onto the leaves to prevent if from burning on the polythene. Roots are shallow rooting, very important to maintain moisture. Runners can be removed so the growing energy produces fruit. Seaweed sprays every couple of weeks supply trace elements as well as prevent most fungal diseases. These will also enhance flavour. Liquid feeding is beneficial especially for container grown plants. A formulation recommended for tomatoes is ideal. Some varieties for example Tioga, respond to a big 'Haircut' after the summer crop where all the leaves are removed. Feed and water well to stimulate an autumn crop. Some of the newer varieties are worth experimenting with. Birds are the main pest, but slugs may also be a problem in spring, eating the new foliage (as may birds in some districts) and again in summer, eating the fruit. Remove dead foliage from the plants to help minimize disease and housing of pests. Strawberries will generally need replacing after a couple of seasons as root diseases and virus build-ups tend to weaken the plants. Completely destroy old plants to prevent any disease carry over. Variations in soils types will produce subtle variations in fruit flavour, as will the time of year. The main influence likely to be noticed is day length. 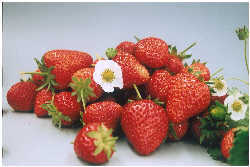 Strawberry hybrids are classed as day neutral, short day or long day. Day neutral varieties will fruit any time of year that temperatures allow. Short day varieties initiate flowers during the short days of spring and autumn, with the main crop coming in early summer and another in autumn. Some varieties such as Tioga (short day) are excellent planted in summer. The plants then establish and produce a heavy crop the following summer.